Martin Fay, a classically trained violinist who helped revive traditional Irish music as a founding member of the Chieftains, died on Wednesday in Dublin. He was 76. His son, Fergal, confirmed the death. The Chieftains formed in 1962 as pacesetters of a new movement to reclaim the pure musical traditions of Ireland from the relatively slick commercial-sounding groups that had come to dominate the folk stage. Mr. Fay played haunting fiddle lines and contributed popping rhythms by knocking together a pair of bones, a time-honored Celtic instrument. 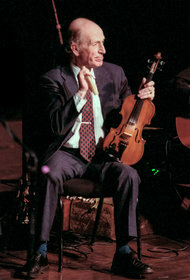 His fiddle is the first sound heard in the Chieftains’ music for Stanley Kubrick’s 1975 film, “Barry Lyndon”, a performance that helped propel the group to world recognition. In 1989 the Chieftains were appointed official musical ambassadors for the Republic of Ireland, a role they fulfilled by performing with the Rolling Stones, the Boston Pops, Willie Nelson and Luciano Pavarotti. They entertained Queen Elizabeth II when she visited Ireland in 2011. They played before the pope and on the Great Wall of China. They have made more than 40 albums and won six Grammys. Mr. Fay was born in Dublin on Sept. 19, 1936. Inspired to take up music after seeing a film about the violinist Niccolò Paganini, he studied the violin and won a scholarship to the Municipal School of Music in Dublin. He played in the orchestra of the Abbey Theater, Ireland’s national theater. Increasingly fascinated by Ireland’s indigenous music, Mr. Fay was recruited by Sean O Riada, the leading figure in reviving the old music, to play in the ensemble he led, Ceoltoiri Cualann. Paddy Moloney, who played the traditional Uilleann pipes (the Irish bagpipes), and was also a member of Ceoltoiri Cualann, started the Chieftains. The other original members, besides Mr. Fay, were Michael Tubridy on wooden flute, Sean Potts on tin whistle and David Fallon on the bodhran. Mr. Fay stopped touring in 2001 and retired the next year. Mr. Moloney is the only original Chieftain still playing with the group. (Mr. Tubridy and Mr. Potts left in 1979, Mr. Fallon in 1965.) The other current members, now a quartet, are the fiddle player Sean Keane, the vocalist and bodhran player Kevin Conneff and the flutist Matt Molloy. In addition to his son, Mr. Fay is survived by his wife, Grainne, known as Gertie; his daughter, Dearbhla Fay; a sister; and a grandson. Here are three transcriptions of Martin Fay. This list was generated on the Search page by unclicking the 'Search Only Items That Are Transcribed' checkbox and selecting 'Fay, Martin' from the [All Musicians] dropdown.